The Microsoft Surface Pro 3 has been released and, according to these lawyers, it finally lives up to the standards of a laptop. It is lighter and more mobile than even the lightest laptop, which makes it better for travel. However, this tablet can download the software and applications that many lawyers use in business like Acrobat, Photoshop, Microsoft Office, while also supporting multiple users. The Digital Edge host Sharon Nelson purchased a Microsoft Surface Pro 3 recently and has put it through the test of whether this tablet can actually replace the laptop she uses for her business. Nelson found that these features made this tablet work for her as a laptop replacement. She found the i7 Processor particularly nice since lawyers often have little patience with a slow computer. However, this isn’t an advertisement for the Surface Pro 3, so Simek pointed out some downsides to the product. Purchasers should expect to pay laptop prices (instead of tablet prices) ranging from $799 to $1949, not including necessary accessories like the keyboard, which will cost an additional $199. The battery life ranges from 8 to 9 hours, relative to the iPad which consistently lasts 10 hours. Also, the Surface Pro 3 can’t sit atop a lap; it needs a hard surface to work with the kickstand. Despite the downfalls, however, Simek and Nelson have agreed that this tablet can replace a laptop, at least in their legal practice. 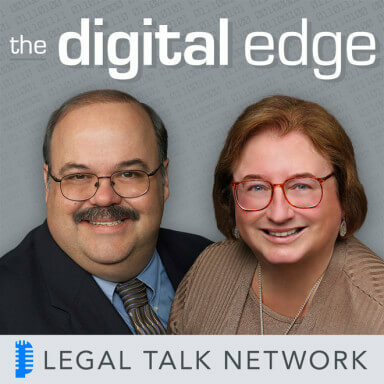 John Simek is the Vice President of Sensei Enterprises, holds many digital forensics and IT certifications, and is the co-host of Legal Talk Network’s Digital Detectives podcast. Simek is the co-author of 12 books with two more slated to come out next year and a frequent speaker on the lecture circuit where he talks about IT, information security, and digital forensics. Special thanks to our sponsor, Serve Now.